From the moment you set eyes on this delightful picture book, you’ll be sure to fall in love with it, as much as the gorgeous little dog inside. Set in the 1950s, Little Dog and the Christmas Wish is a beautiful book to look at, to hold and to read. ‘At first the sights and smells were familiar. Then less so. When Little Dog saw the open door of the baker’s cart, he jumped in. The door slammed shut.’ Little Dog finds himself alone in a busy city, ‘all dressed up for Christmas’, where nothing is familiar; far away from his home and far away from Jonathan. As Little Dog explores the wet and busy streets of Melbourne, he must find his way home safely before dark and before Christmas morning. The illustrations, by Robin Cowcher, are stunning with an ink and water colour effect. Each sketch is beautifully detailed and highly fitting with the period. 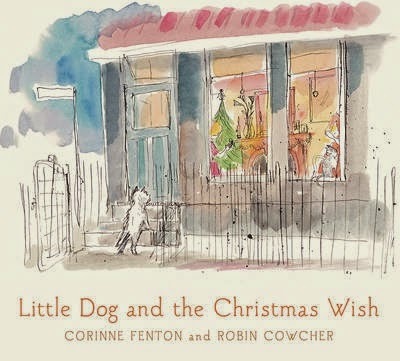 Cowcher’s illustrations are superbly matched with award-winning author, Corinne Fenton’s skilfully simple and heartfelt text. As you turn the pages, you will love recognising the distinguished Melbourne landmarks featured; Flinders Street Station, Collins Street and the Bourke Street Mall. Children will be reminded that Christmas wishes can come true, as Little Dog and the Christmas Wish ends happily, and Little Dog eventually finds his way home. This charming and nostalgic Christmas story is the perfect Christmas Eve read. It’s sure to become a favourite and a book to treasure always. i love the review so i brought it and my daughter loved it!